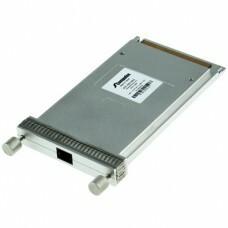 The 40GBASE CFP transceiver modules are hot-swappable input/output devices that plug into a 40 Gigabit Ethernet CFP port. They offer customers versatile 40 Gigabit Ethernet connectivity options in core and distribution layers of data center, enterprise, and service provider networks. The 40GBASE-SR4 CFP module supports link lengths of up to 100m and 150m, respectively, over laser-optimized OM3 and OM4 multimode fiber cables. It enables high-bandwidth 40 Gigabit Ethernet optical links over ribbon fiber cables terminated with female MPO/MTP 12-fiber connectors. This CFP module supports IEEE 40GBASE-SR4 standard only. Dimensions (D x W x H): 144.8mm x 82mm x 13.6mm.